Is it the Robbe ASH26 canopy? I have one and can make a mould for you. Anyone know where can provide small volume vacuum forming service? Would you please measure the dimension of the canopy. I have to see if my forming platform and oven are large enough. 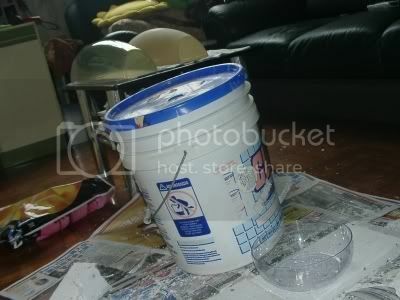 Mak, there is a special glue for "canopy" or try contact cement (clear type). At least you can put the pieces together and then make a plug. CA glue is brittle when cure. Canopy glue is flexible and is available at Waigo (hopefully). CM, it is easier if your canopy is uncut. For moulding the plug, please consider using yellow plaster. Yes, it's the Robbe ASH26 canopy. How are you going to make the mould? There are 2 methods in my mind. each have its disadvantage. 1. pour plaster in to the canopy. Plaster is heavy which might break the original. 2. spray self expending foam in to the canopy. 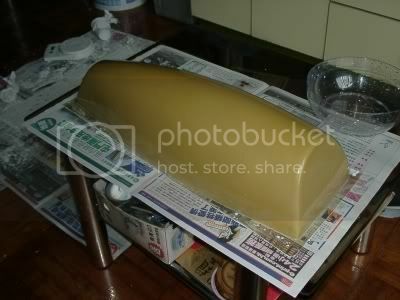 This foam is light, hence may not fill up all spaces to form a good mould. I didn't measure the size, but it should be around 1.5' x 9"
I have an idea which might work without danger of breaking the original canopy due to weight. We can put the canopy on water, and allow the canopy to sink into water, as we pour plaster into it. We must keep the edge of the canopy above water surface. so that water outside the canopy will balance out the pressure inside the canopy. 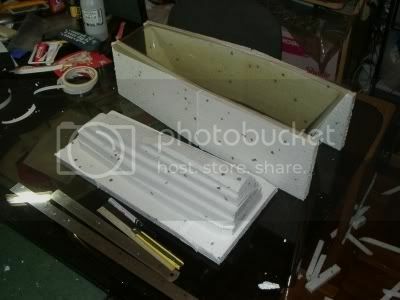 With that much plaster, the whole thing might get very hot and deform the canopy! Yeung, does yellow plaster generate much heat ? 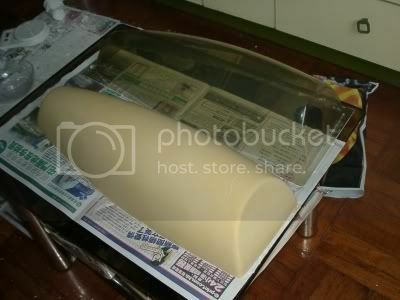 You really do not fully fill the canopy with plaster, you can insert some foam in the center. (Less weigh and less cost). The plaster is thick enough that the foam will not float up. Yellow plaster will not melt down you canopy. White plaster or fiberglassing with thick layer of epoxy will generate too much heat. Your concern about overloading the canopy is correct. Big volume and mass of the plaster will push the canopy out and distort the shape. So it is necessary to support it outside before pouring in plaster. You can frame it with cardboard, white foam or some wood strip. Putting the original canopy in water will make life harder. If the canopy is not rigid enough or supported, the heavy and dense plaster will still pushing out. Neither the expanding foam method sounds good. The hot plastic sheet will be placed and pressed down to this plu and I don't think the foam one can hold it. 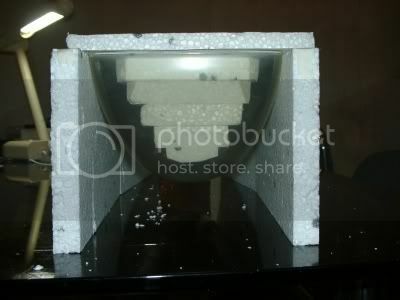 It is necessay to know the height of the canopy so as to estimate the size of the plastic sheet. It is not just the size of the base but also the material of the lateral surface. It seems that my equipment cannot handle your project. A large heater and a large forming platform are needed. For the platform, you can consider a drawer of a cabin or cupboard. But a large oven which can accomodate a big turkey is necessay. Mine is just a small one. Is it possible to make it two portions? I just measured the size. It's 21" x 8" x 5"
Is it possible to hold a 2000W heater or a hair dryer above the setup to heat things up, while pulling vacuum with a vacuum pump ? Don,t forget .I have a factory in china,we can do any type of canopy .any colour ,any thickness !!!!!!!!! !sent me your mold master !!!! Sent me as soon as possible ! Did you sent the canopy to Ah Kin yet ? If not, better take it with you to MOS. I'm looking forward to fly the ASH26 together with yours. BTW, start your ASH26 project early, and post the installation photos. I will bring the mould to MOS tomorrow. It is very heavy, I think it is over 8Kg. What! It's not finished ? Well, I have more plaster. How much plaster should I bring ?